mishloach manot – Portions of food and drink — at least two different foods ready to eat — given as a gift during the spring holiday of Purim. mitzvah – One of the 613 Biblical commandments or one of the laws instituted by authoritative rabbinic scholars. Examples of Biblical laws: Don’t murder (Exodus 20:13), don’t steal (Exodus 20:13), treat strangers who reside among us as citizens (Leviticus 19:34). Examples of rabbinic laws: Light Hanukkah candles, don’t pick up scissors on Shabbat. The term is often used informally to mean a good deed. 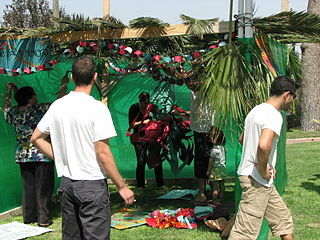 sukkah – A temporary hut built outside where people eat during the festival of Sukkot. There are some basic rules to be observed during construction, but once you’ve got it built, the fun part, especially but not exclusively for kids, is hanging fruit from the ceiling. Did I mention Sukkot is a harvest festival? Sitting outside in the sukkah for an after-dark dinner with friends, family, and a couple of glasses of red wine can be a rather nice way to spend a fall evening. Sukkot – An eight-day festival that begins four days after Yom Kippur. Many people count the eighth day, Shemini Atzeret, a separate holiday, and so consider Sukkot a seven-day holiday. It’s an autumn harvest festival (autumn, at least, in the northern hemisphere). It’s a mitzvah to construct a temporary shelter, called a sukkah, outside, and eat your meals in it. Kids tend to get excited about the idea of sleeping in the sukkah, but that tradition tends to get talked about more than it’s actually done. Another mitzvah associated with Sukkot is to ritually wave a lulav –palm front– and etrog –a lemon-like fruit with a characteristically thick stem– along with willow and olive branches. Jewish teaching associates spending time in the sukkah with the forty years the Israelites spent living in the desert after being released from slavery in Egypt. Jewish mystical tradition associates the waving of the lulav and etrog with the unification of the Creator’s name. It’s my favorite mitzvah. Tabernacle – A movable structure of wood, cloth, and animal skins built by the ancient Israelites using instructions given to Moses by God. It contained the Ark of the Covenant, on which God’s presence sometimes rested, as well as furnishings for sacrifices and other activities. The Tabernacle could be taken down and re-erected each time the tribes moved camp. tallit – prayer shawl. A rectangular garment distinguished by its four corners and the sets of knotted strings, the tzitzit, hanging from each corner. A version that fits over the head for everyday wear, with those tzitzit swinging so fetchingly, is called a tallit katan. Alternates: tallis, tallith. Temple – The formal structure built in ancient Jerusalem for prayer, sacrifice, and festival gatherings. The First Temple was built by King Solomon but destroyed when the Babylonians captured Israel. It was rebuilt after the fall of the Babylonian Empire, but this Second Temple was later destroyed by the Romans. tzitzit – The sets of long knotted strings that hang from the corners of a tallit. Alternate: tzitzith.